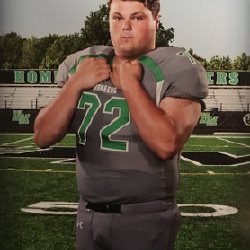 Zach Zarembinski, a standout two-way lineman for Hill-Murray’s football team, suffered a brain bleed on his left side during a Saturday afternoon playoff game and was taken by ambulance to Regions Hospital in St. Paul. Hill-Murray activities director Bill Lechner, who attended the Pioneers game Saturday at St. Paul Johnson High School, said Zarembinski “jogged off the field” with teammates after a punt. “Then all of a sudden they’re yelling for us,” said Lechner, who credited athletic trainer Laura Henn for quickly getting Zarembinski the needed care. Hill-Murray coach Pete Bercich posted Sunday on Twitter, "We want to thank the St. Paul Fire Dept and the EMTs for their amazing response as they saved a young man's life." Zarembinski's mother wrote that her son “suffered an injury resulting in a brain bleed on his left side.” Lechner said he did not notice Zarembinski, a 6-2, 308-pound senior, in any prior distress in the Class 4A, Section 3 semifinal game, a 28-0 St. Paul Johnson victory. “No one saw a hit or anything,” Lechner said. A GoFundMe page was set up to help his family with medical costs incurred. The page reported pledges of about $15,000 Sunday evening.